U.S. stock futures are slightly lower. Oil prices are seeing a bit of life, with crude trading around $37 a barrel after declining Monday. 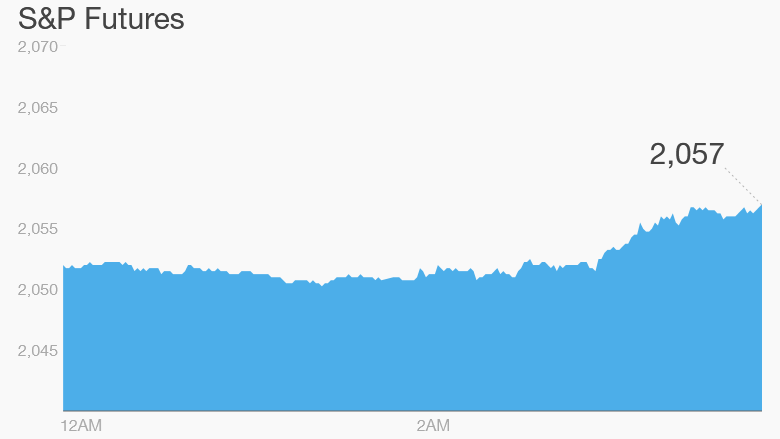 European markets are bouncing higher, with shares in Paris and Frankfurt up by more than 1%. Asian markets rebounded as well after falling Monday. Deutsche Bank (DB) has decided to sell its 20% stake in China's Hua Xia Bank for about 3.5 billion euros ($4 billion) to raise capital. Its shares jumped 2% in early trading. Shares in mining giant Anglo American (AAUKF) are down more than 4% in London as commodity prices continue to hurt the sector. Anglo is massively reorganizing in the new environment of lower prices. Keep an eye on Valeant (VRX) after the troubled drug maker said its Chairman and CEO J. Michael Pearson has gone on immediate medical leave. At 10 a.m. ET, the Conference Board will update its Consumer Confidence Index with a December reading. In November, the index hit 90.4, a big drop-off from October's 99.1. 3. Monday market recap: The Dow Jones industrial average was down 0.1%, while the S&P 500 and the Nasdaq each shed 0.2%.